Interment will be at Riverside Cemetery in Pierre at a later date. Behrens-Wilson Funeral Home, Rapid City, SD is in charge of arrangements. Memorials may be directed to Pierre Senior Center 401 West Pleasant Drive, Pierre, SD 57701. 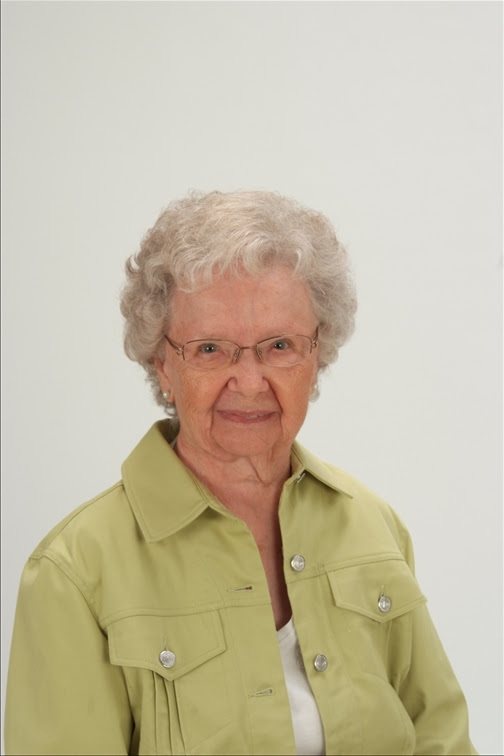 Blodwyn VonWald, 100, a long time Pierre, SD resident and for the last several years, a resident at Westhills Village in Rapid City has passed away. Blodwyn, known by many of her friends and acquaintances as “Mrs. V” was born on March 5, 1919 to William and Nora Roseland on a farm near Seneca, South Dakota. She completed her journey through this life at her Westhills Village home when she went to be with the Lord on April 13, 2019. In 1936 Blodwyn graduated from Seneca High School and was honored to be chosen as its homecoming queen upon the vote of her community. She married Maurice VonWald on June 1, 1941, at the Faulkton, SD First United Methodist Church. Three children, Sheris VonWald Stientjes, Larry VonWald, and Karla VonWald Lynde were born into this marriage. The family lived in Gettysburg, SD until Maurice enlisted in the U.S. Army during World War II. While Maurice was in the Army, they lived temporarily in Long Beach, California, Little Rock, Arkansas, Tyler, Texas and Muskogee, Oklahoma. Upon Maurice’s discharge from the military they returned to Gettysburg where they remained until 1952. At that time, the family moved to Pierre where Maurice undertook his duties as District Engineer with the SD Dept of Highways. Upon Maurice’s death in 1960, Blodwyn began a lengthy career working outside the home she made for herself and her children. She worked at the Pierre Credit Bureau for ten years. Blodwyn then worked twenty-five years in State government that included time in the Planning Agency and the Department of Education. She was employed at the same time by St. Mary’s Hospital in Pierre where she worked evenings and weekends in the admissions office. Blodwyn was active in the Pierre community as a volunteer and a member of numerous organizations including the General Federated Women’s Club, Eastern Star, Professional Secretaries Association, International Sons of Norway, Pierre Area Senior Citizens, RSVP, First United Methodist Church of Pierre, Countryside Hospice, St. Mary’s Hospital Auxiliary and the World Relief Quilting Group at the Lutheran Memorial Church. For fifteen years following her retirement, Blodwyn began spending the winter months in Safety Harbor, Florida where she was active in the Heritage United Methodist Church as a member of the Young at Heart Bible study group, a member of Joy Circle and the quilting guild. Blodwyn is survived by two of her three children, Larry (Diane) VonWald, Rapid City, and Karla (Chuck) Lynde, Safety Harbor, Florida; grandchildren Michael (Erica) Stientjes, Des Plaines, Illinois, Jon (Lily) Stientjes, Chicago, Illinois, Kristin Stientjes, Fredericksburg, Virginia, Dr. Grant (Holly) Lynde, Decatur, Georgia, Dr. Leigh (Matt) VonWald Bedell, Overland Park, Kansas, Drew (Melissa) VonWald, Nashville, Tennessee, great-grandchildren, Alexandra, Nicholas, Steven, Eric, Jason and Brandon Stientjes, Madelyn and Julia Lynde, Grey, Luca and Drake VonWald, and Mason and Lauren Bedell; brothers Bevin (Vivian) Roseland, Seneca, SD and Boyd Roseland of Pierre. Numerous nieces and nephews also survive. She was preceded in death by her parents, her husband, Maurice, her daughter, Sheris, her twin sister, Bernice, as well as her sisters, Gayl Taylor and Corine Coleman, her brothers, Melvin (Bud), Merwin (Rex), Eugene Roseland, Ronald (Hoss) Roseland, Gary Roseland and Richard (Tug) Roseland.